This malware has certain interesting characteristics which I wanted to share. Note: It is also known as BayRob. After decrypting the strings, we can get some more indicators. 1. It uses a lot of code obfuscation. Even though the binary is not packed, the code is obfuscated to make the process of reversing it difficult. 2. It uses a Domain Generation Algorithm. The algorithm used is interesting because the domains are generated from a dictionary. So, they do not look random. 3. The email address of the recipient of the spam email is hardcoded and stored as an encrypted string in the binary. 1. String Decryption - An in depth look at how the Strings are encrypted in this binary and how we can efficiently decrypt them. 2. Anti Memory Dumping Techniques - It removes all traces of decrypted strings from the memory after they are used. 3. Code Obfuscation - The Nivdort variants use a large amount of FPU and SSE2 instructions for code obfuscation. One of their variants also creates a lot of threads as an anti debugging technique. 4. Seed Generation Algorithm - Details about how the seed for DGA is generated. 5. Domain Generation Algorithm - The details of algorithm used to generate domains. 6. Domain Name analysis - Details of information we can gather from the domain names. All the strings corresponding to file system, windows registry and network callback are encrypted in this malware. Let us look at the how the strings are decrypted at run time. It generates a Decryption Table from a single DWORD. The size of the decryption table is 0xe32 DWORDs. This means, the total size is: 0xe32 *4 = 0x38c8 bytes. 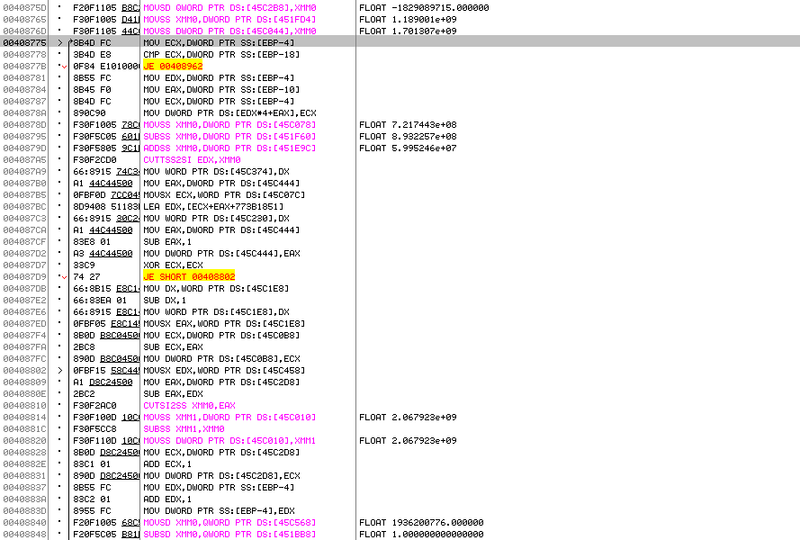 In the screenshot above, you can see the Decryption Table returned by the subroutine. We can see that by performing different arithmetic and logical operations on the single DWORD key, it generates a table of size 0x38c8 bytes. Once the Decryption Table is generated, it calls the String Decryption Function. The string Decryption Function, takes two arguments as an input. One is the size of the decrypted string and the second argument is the offset into the Decryption Table. The binary stores an encrypted blob at a fixed address. The offset above is the same for both the Decryption Table and the Encrypted Data. An XOR operation is performed between the corresponding bytes to get the decrypted strings. Once we have written the decryption subroutine in the debugger, we need to set the EIP to our subroutine and execute the above loop. 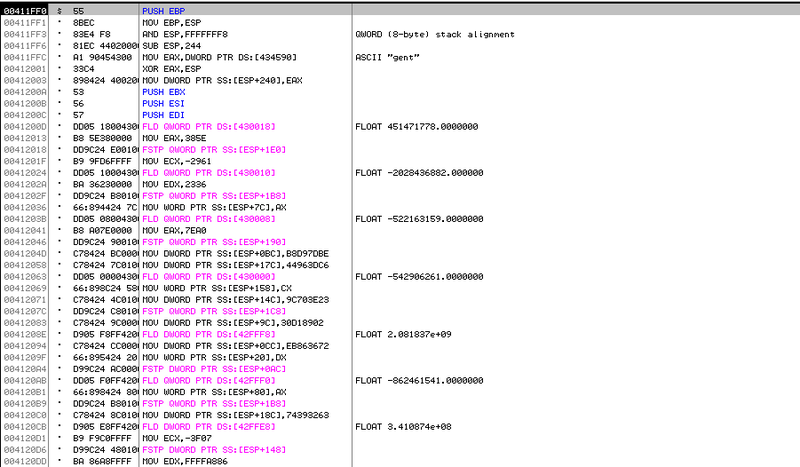 In the memory dump we can see the list of decrypted strings. It is important to enable the Write protection on the memory page corresponding to Encrypted Data. In this way, we can decrypt all the strings at once. Now, let us look at some of the decrypted strings and how they are related to the file system artifacts dropped by this malware. It is important to note that even though the filenames of dropped files look randomly generated, they were actually hardcoded in the binary and stored as encrypted strings. It is common for analysts and also automated analysis systems to take a memory dump of the binary during execution and get the decrypted strings from there. The decrypted strings often give us an indication about the malware family name and are very useful. Nivdort ensures that the strings are cleared from the memory after they are used. In the screenshot below we can see that an array of strings which were used to generate the domain are passed as a parameter to the subroutine, RemoveTrace for clearing it from memory. This will be done after the domain name generation process has completed. 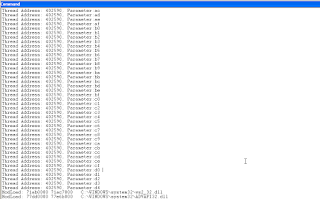 As a result of this, it is not possible to get all the decrypted strings from the memory dump. 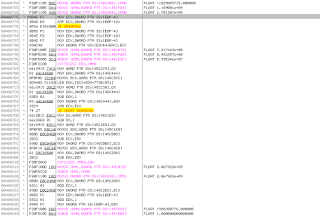 Even though the Nivdort binaries are not packed, they use a lot of code obfuscation by adding FPU and SSE2 instructions. The large amount of junk code added in the binary makes the process of reversing it difficult. 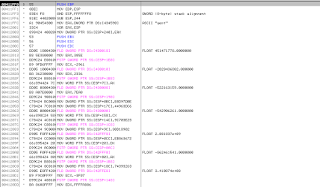 Below are few examples of the code sections which have a lot of FPU/SSE2 instructions. In between these code sections, we have the relevant code section used by the binary. Multiple Thread Creation: Some variants of Nivdort also use an anti debugging technique to make the process of reversing it difficult. They create a lot of threads and all these threads have the same thread function. The parameters are passed to these threads in an incremental order. bu kernel32!CreateThread ".printf \"Thread Address: %x, Parameter:%x \", poi(esp+c), poi(esp+10); .echo; gc"
When we run the binary, we can see the log of thread creation. We can see that the binary creates a total of 213 threads. There are some variants of Nivdort which use the same technique and create more than 700 threads as well. Now, let us look at the seed generation algorithm. We know that every Domain Generation Algorithm requires a certain level of randomness in it. To introduce the randomness in the algorithm, we need a seed. 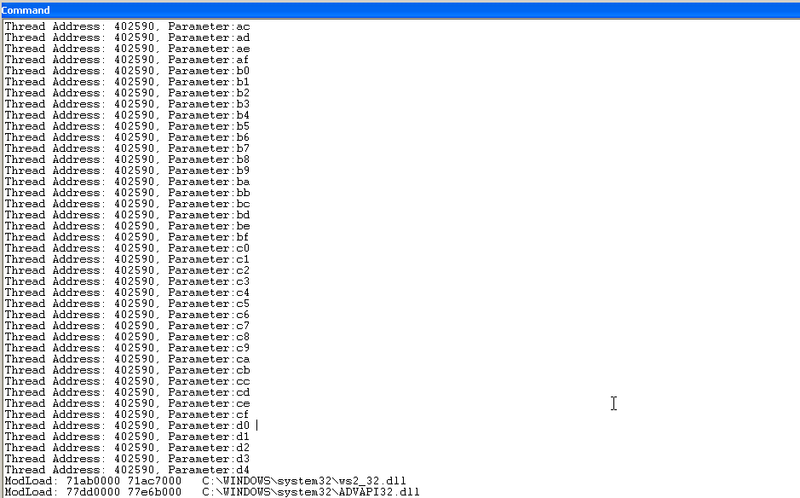 So, let's see how the seed is generated by Nivdort. Nivdort uses GetSystemTimeAsFileTime() to generate the seed. The return value of GetSystemTimeAsFileTime is a pointer to FILETIME structure. The resulting value of seed is shifted right by 9 before being used in the DGA. HelperTable: This table is used to generate single byte constants which are used as an offset into the array of strings. Array of Strings: The array of strings are used to generate the domain name. Each domain name consists of two strings from this array. The offsets used in the array of strings are randomly generated using the HelperTable and the seed. 1. Using the seed, a bitmap of size 0xf is calculated. 2. The bitmap generated above is used along with the HelperTable to generate two constants (const1 and const2). Both these constants are single byte. The interesting fact about the DGA used in Nivdort is that even though the domain names are generated randomly, they do not look random. As a result of this, algorithms which check the domain names for randomness to conclude whether they are randomly generated or not will not work. Most domains generated using DGA by other malware families look random and are categorized as suspicious by Domain Name analysis algorithms, however Nivdort bypasses that. Let us perform a whois lookup on it. We see that the domain name is not registered yet. Now, let's execute the malware in a virtualized environment and capture the network traffic. Let us perform a whois lookup on the resolved domain name, orderreason.net. We can see that this domain was registered on 5th Dec 2015. At the time of writing this article, the date is 6th Dec 2015. Similarly, on another execution of the malware, we find one more live domain. Let us perform a whois lookup on the resolved domain name, heavenalmost.net. We can see that this domain was registered on 6th December 2015. There are 2363 other domains associated with this registrant. Let us perform a reverse NS lookup on the DNS Servers mentioned above. In the list of domains associated with these nameservers, we can see a lot of domains which follow the same pattern as the domains generated by Nivdort's DGA. Nivdort is an interesting malware family and some of its characteristics are specific to this malware family.